Each person from the residential and non-residential sectors in Connecticut disposes around 4.95 pounds of trash every day. This means that, altogether, we generate 3,179,224.36 of wastes every year. Most of these wastes are sent to one of Connecticut’s seven Resource Recovery Facilities. These facilities all have modern pollution controls that lessen air emissions resulting from the combustion process. The wastes are then burned as fuel for generating electricity, and the ash by-products are buried into especially designed and lined landfills. Some towns have recycling and trash services for multi-family residences with 2 or 3 apartments. However, most businesses, condominiums and apartment buildings directly contract with trash haulers, dumpster rentals and roll-off services in Connecticut for garbage collection and recycling. The hauler, dumpster company or roll-off service cannot pickup the recyclables if they are mixed with trash. The law also requires “source separation”, or that the recyclables be separated from the trash within the place where they are generated. The recyclables are then sent to one of the six intermediate processing centers, wherein they are readied for businesses that can convert them into new products. A number of centers also collect the non-mandated recyclables that have suitable markets. But simply gathering the segregated recyclables from dumpsters and roll offs to the recycling centers is not recycling. Recycling happens once the recyclables are used to make another products, and completes when the products are bought and used. Thus, we only do not need to recycle items in ways that maximizes their value and quality, but also patronize and use them when they become available in the market. Both private and public schools are required to recycle. Educational institutions have the special obligation to practice the environmental ethics they impart, enabling students to recycle, not only in their homes, but also in school. Most of all, each municipality has local ordinances that enforce recycling of the mandatory recyclables. Thus, local communities are authorized to enforce the local ordinances on illegal dumping, littering and recycling. So how else can we promote proper recycling in our towns? Get involved with Connecticut Recycles Day, which happens November 15th of each year. 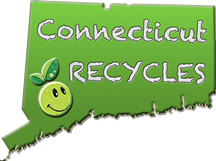 Visit the Connecticut Recycles Day website to see resources, ideas and coordinate for this event in your town. Find out how to get a recycling bin and what can be recycled in your town. Contact your Department of Public Works, municipal recycling coordinator, town hall and town websites for this information. The information about Fairfield and New Haven municipal recycling coordinators are here. Rent a recycling dumpster for huge amounts of trash and segregated recyclables. GPOD Dumpsters can provide you with dumpsters and roll-off services in various sizes for all waste types, including recyclable materials. GPOD especially caters to homes and business and Fairfield and New Haven, Connecticut. Connecticut has a huge potential for doing much better in recycling. Only if we will continue to expand our waste reduction and recycling efforts will we feel its global and local environmental benefits, and also lessen our public expenditures for waste disposal.